Roda road 115 ottoman Overview: Inspired by the 1950s and 1960s Scandinavian furniture designs, Road collection designed by Rodolfo Dordoni combine design and handcrafting, tradition and technology, have been combined into an innovative project that reminds one of nature and where the teak is a protagonist. Road is made from a stretched net anchored to a "clean" teak structure, with an essential but very comfortable shape. Road is a transversal and flexible collection, which fits in every background, suitable both for indoor and outdoor. Details: The Hydro Draining Technology: The upholstered collections have perfected the notion of breathability in hydro draining cushions, attaining the highest level of complexity and efficiency. For the upholstered collections, Roda combines open-cell polyurethanes of different. 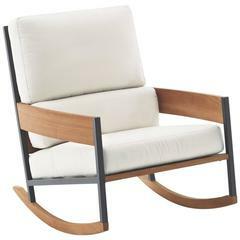 Finishes: Solid teak / mole net sling / dew T27 steel fabric Dimensions: W 29.5" x D 29.5" x H 16.25".